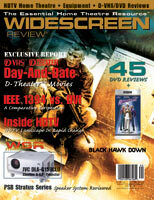 I read Widescreen Review because it has had a consistent editorial perspective since its inception: a no-compromise approach to making home theatre the best that it can be. I have read the magazine cover to cover since Issue 2. Despite staff and reviewer changes over the years, thanks to Gary's leadership this perspective has never changed. As new technologies are introduced, Widescreen Review always provides in-depth analyses of not just the technology itself, but the political and industry forces that may be forcing compromises in its development. You have always sounded the clarion call to stop compression madness or any other madness that may force us to accept a home theatre experience that falls short of what it could be. Thank you!